관광에도 비지니스 출장시에도 멘도사에 방문 하실 때 최고의 호텔 선택은 빌리지오 부티크 호텔 입니다. 이곳에서 생생한 도시의 모든것을 쉽게 즐기실 수 있습니다. 편한 위치와 함께, 호텔은 도심의 필수 관광지에 손쉽게 접근할 수 있는 곳에 있습니다. 빌리지오 부티크 호텔에는 다양한 시설이 있어 멘도사에서의 시간을 풍요롭게 해줍니다. 호텔에는 최고의 특색을 가진 카지노, 24시간 프런트 데스크, 장애인용 편의시설, 여행 가방 보관, 룸 서비스도 있습니다. 또한, 모든 객실은 편안하고 안락하게 꾸며져 있습니다. 대부분의 객실에서는 고객님의 편안함을 더하기 위해 인터넷(무선), 인터넷-무선(무료), 금연 객실, 에어컨, 난방 등의 편의 시설을 제공해 드립니다. 호텔의 온수욕조, 헬스장, 사우나, 실외 수영장, 스파 등은 바쁜 일상을 뒤로하고 편하면서 긴장을 풀기에 완벽한 곳입니다. 최상의 시설과 완벽한 위치의 빌리지오 부티크 호텔 숙박시설은 멘도사에서 즐겁게 머무르시기에 완벽한 장소입니다. The hotel is in a modern building, with comfortable rooms. It is located next to shopping and restaurant streets. The staff was very friendly and helpful. The pool is small, but it is nice to relax in the backyard where it is located. Good location, close to nice restaurants, helpful staff, spacious room &'bathroom. We were upgraded to superior room, which we appreciated. we did like the hotel even though the rooms have "thin walls", so be aware of this. the staff is very friendly and helpful with booking tours, giving restaurant suggestions. the locations is in the center so everything is in walking distance. breakfast is great with typical argentinian as well as italian selections. room is comfortably large and there is a sauna and a swimming pool there as well, but we did not use these facilities. the bathroom did smell musty, but was clean. Great pool and clean rooms. 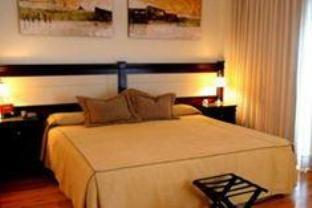 this hotel is a great location about one block from the center of town and the main city park. the rooms are very nice and clean. the walls are very thin, but it was not an issue for us. there is a roof top gym and and a beautiful pool downstairs. the staff was great. we stayed 3 extra nights and enjoyed our stay at this hotel. Os quartos são bons, limpos, a localização adequada. Mas fiquei com uma péssima impressão do hotel porque permitiram hospedes levarem mulheres para seus quartos. Esses mesmos hospedes ficavam todos os dias com as portas dos quartos abertas e no inicio da manha estavam somente de cueca, bem em frente ao elevador onde todos passam. Devido a essas situações fiquei em duvida sobre que tipo de hotel é esse. Fora isso, foi tudo bem. Pareceu ser um ambiente mais masculino.